How can Property Owners and Facility Managers benefit from installing First Alert® OneLink® alarms? Property Owners and Facility Managers of existing buildings can save an average of $150 - $200 per alarm on installation when compared to hardwired alarms, when they do not have pay for the retrofitting costs of time, material and labor to connect to an existing alarm circuit and incur drywall repairs, painting, etc. This does not account for special cases requiring conduit (in some parts of the country), wire mold, concrete drilling, etc. Turnaround time is much faster. Case in point, Penn State University in State College, PA accepted First Alert® OneLink® alarms as a viable alternative to hardwiring alarms in existing off-campus housing. Code officials are recognizing the benefits of First Alert® OneLink® alarms. 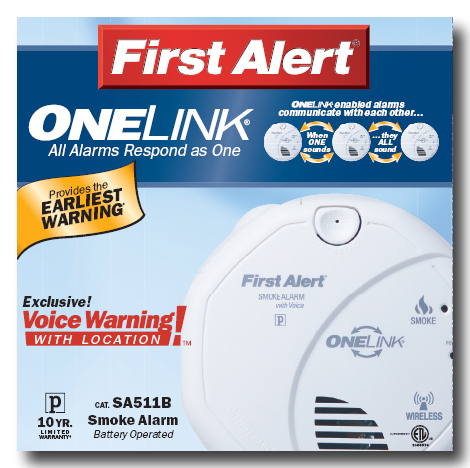 See our lineup of OneLink Wireless Battery and OneLink Wireless Hardwired Alarms. »Download OneLink Wireless Alarms FAQ's in pdf format.